Should I Use an Exclamation Mark? When deciding whether or not to use an exclamation mark, the first question to ask is: What is the thing you’re exclaiming? Use Words: Words are uniquely capable of conveying emotions and information. Punctuation is not. Try Harder: Find something more interesting to write about. Go for it: Use an exclamation mark. But use it wisely. Is it an actual emergency? If the answer is: “Well it is to me”, then is the thing you wrote an actual exclamation like Hey! Whoa! Oops! or Wow! If yes, how did you know it was important? Are you psychic? If no, then will adding one of those words get you off my back? Then you ask yourself: If you said this out loud, would you shout it? Yes. With jazz hands. If you answered “Yes. With jazz hands” then the next question is; are you easily excitable? If “Holy cats. YES.” Then consider being honest: is this thing more exciting to you than to your readers? 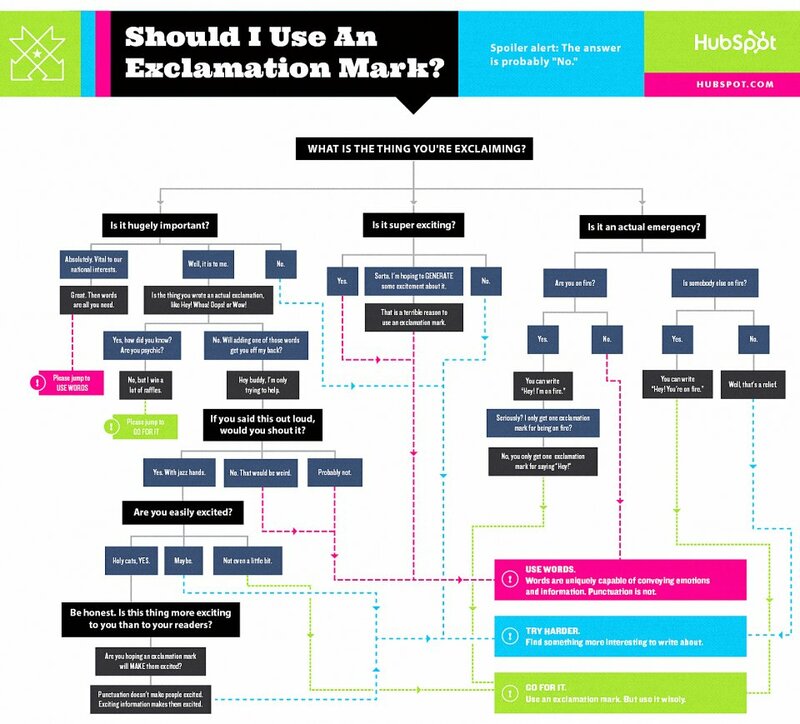 Are you hoping an exclamation mark will MAKE them more excited?